We made more tamales this morning. This time they are filled with black beans flavored with Oaxacan pasilla chiles, garlic and hoja santa. They were wrapped in banana leaves, but I'd already discarded them before bringing the plate to the table. 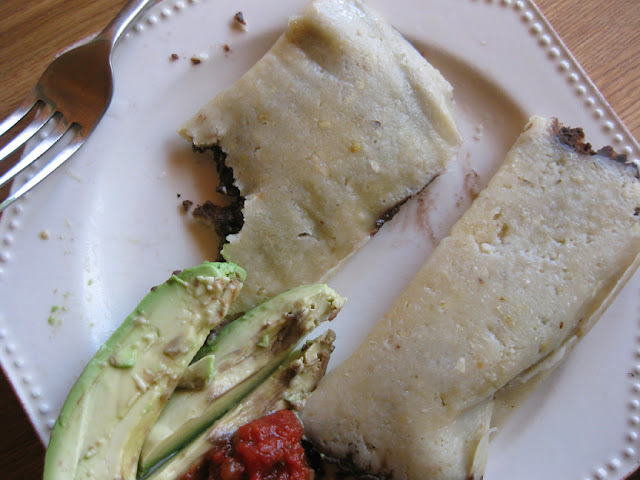 The filling was based on this recipe for tamales Miahuatecos from Zarela Martinez's cookbook The Food and Life of Oaxaca: Traditional Recipes from Mexico's Heart. We didn't have any pumpkin to mix into the masa, so the sweet elements (brown sugar and canela [cinnamon])were excluded. I love a mix of savory and sweet, so the next time I'd like to make the cinnamony pumpkin casings with the spicy black bean filling. I know this sounds weird, my mom wrinkled her nose at the idea, but I might top one of these with Trader Joes seasonal pumpkin ice cream that's currently in my freezer. Anyone a fan of sweet tamales? Yum! Those look totally delicious! !